A week has come and gone for David in his new adventure. It has been interesting testing the waters and finding the groove that works for him. 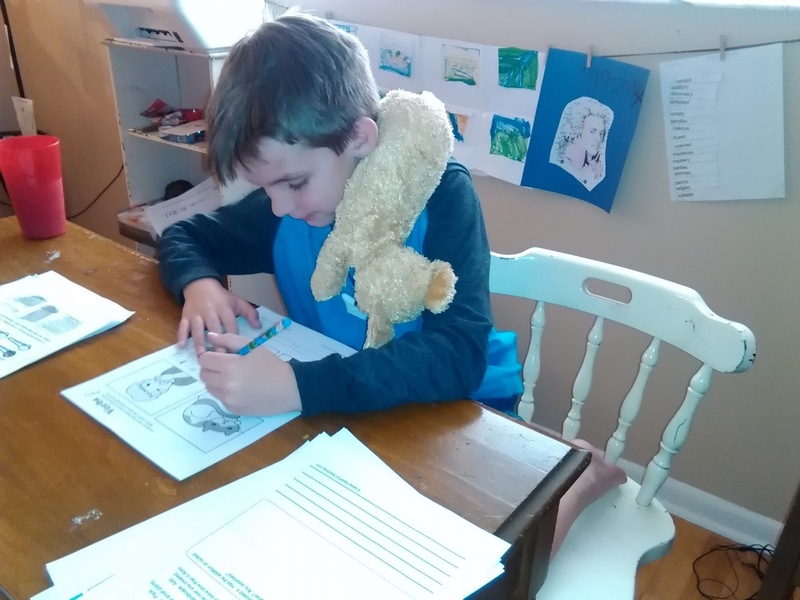 One of the aspects often of Autism is the need for routine. 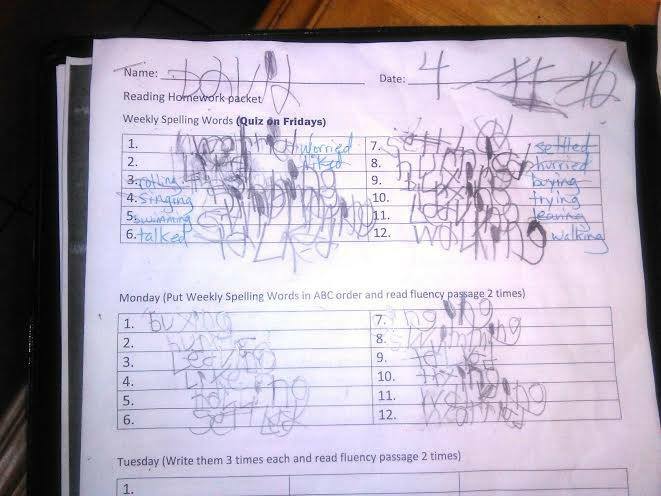 Without it, David seems to have more meltdowns, he becomes anxious. So I decided to have a routine from the time he got up until we were finished with the focused learning for the day. *Free time until 7:30am, then school is in session! 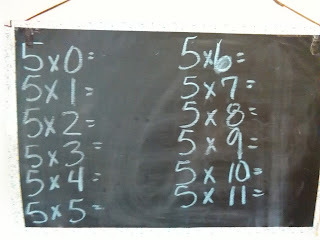 *Math time [which includes 2 lessons from a workbook and chalkboard work. *Science which is a mix of reading lessons, written work, and lab. *Language Arts [which includes writing & spelling. Often this crosses over with science & social studies depending on stories read]. After each subject he gets a 5-10 free time break. We dove in this week with things he loves. He adores anything related to maps. 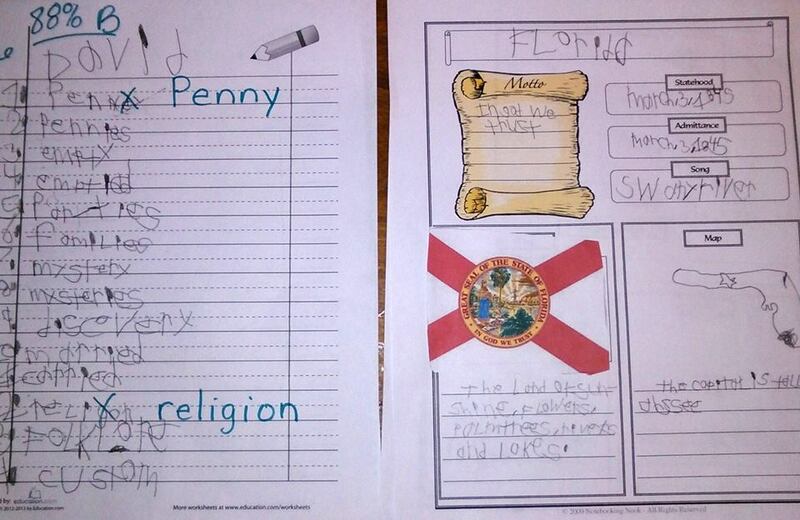 So for social studies we did a Florida unit. 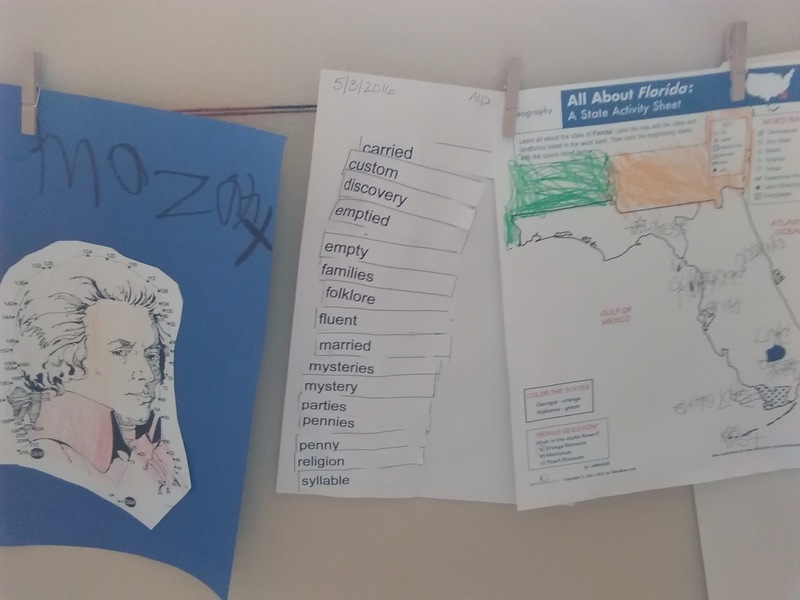 He was so excited to look up all the facts about Florida from its motto to statehood! 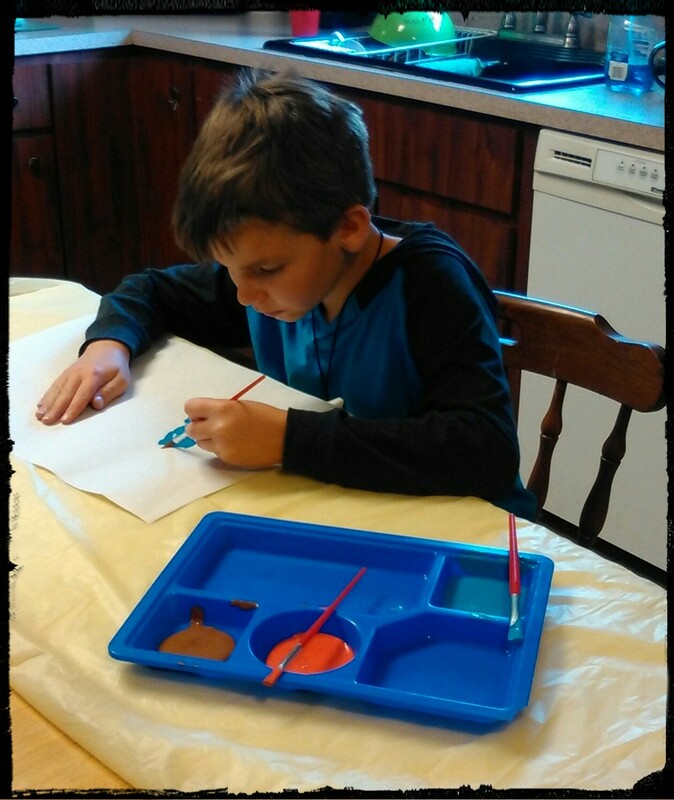 Science consisted of landforms and how they were created. 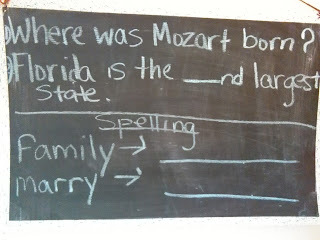 Music focused on Mozart, his life, and works. Art was basic still life. 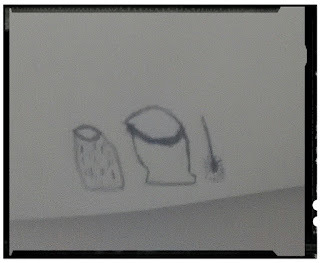 I was impressed with his panting of a fruit bowl and sketch of 2 vases and a flower. He really looked, listened, and loved doing it! A display area for his artwork and hands on work. 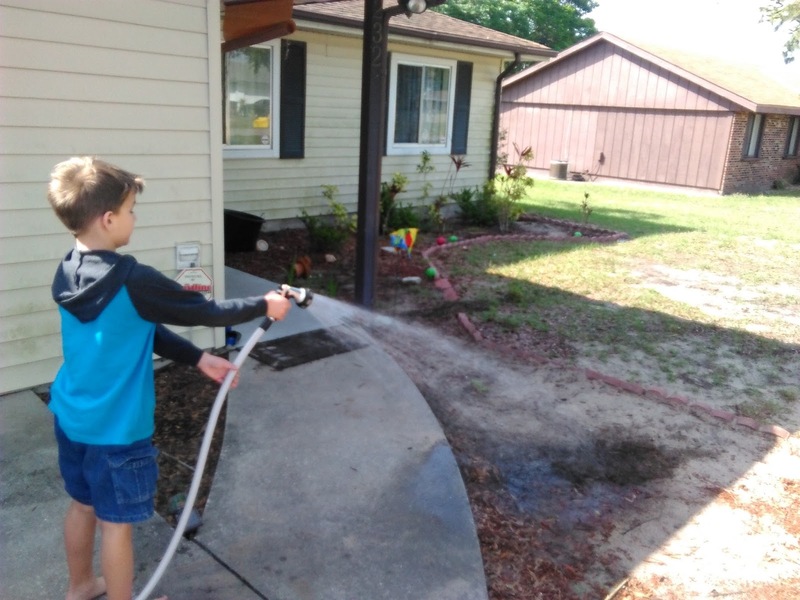 It brightened the area and he loved showing his brother and dad what he accomplished each day. This is a keeper to display each week's displayable work. 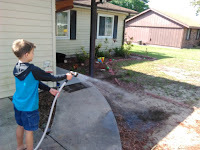 Another thing that he loved this week was spontaneous and natural learning through outings. We made a couple of trips to the grocer's. For one trip I made a list of things we needed, a place for its cost, and the grand total. As we shopped he wrote down prices and then added up what we spent. A good lesson on how much things do cost, and budgeting. The next time we went he had the list to get the items and put them in the cart. Another thing he liked was the hands on science lab. We learned about erosion. 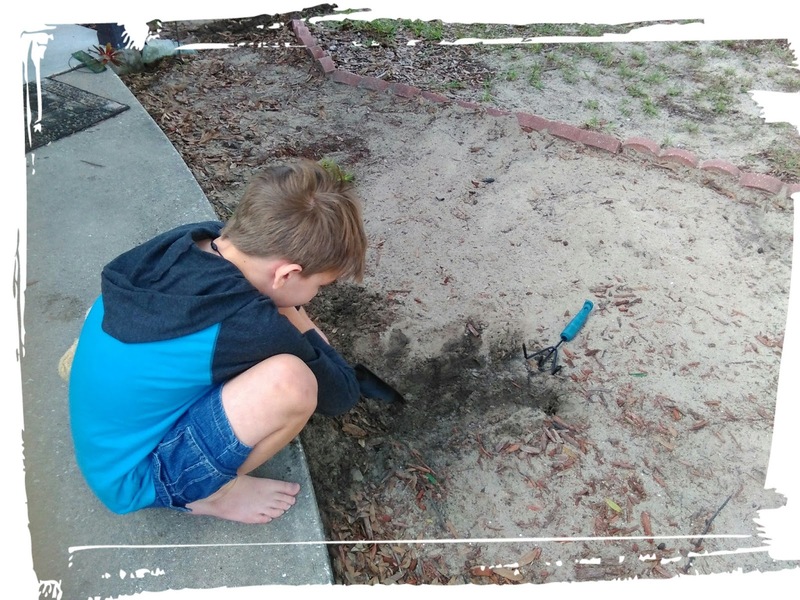 I had him make a land form out in the sand, add water, and observe what it looked like before erosion through water, then after. As we studied how different landfroms [valleys, gorges, etc] were formed, he was fascinated by the Grand Canyon and how it took millions of years for the Colorado River to erode and shape it! He would love to go there, and I would too. I hope one day I can afford to give he and his brother that trip! 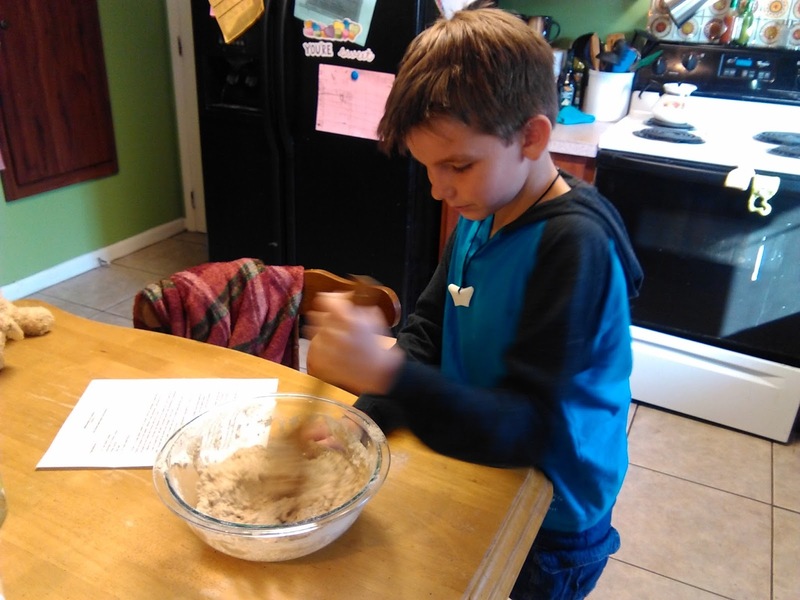 David also did some cooking this week as part of his math and science lessons. Measurement, chemistry, bake times and temperatures also played a part. We made crusty pioneer bread which he loves to eat anyway. Cooking in the cast iron also gave us a chance to talk about pioneers and how they used cast iron and dutch ovens over open fires, in fire places, and wood burning stoves. As we embark on this journey one thing I have to do is keep it on a budget. 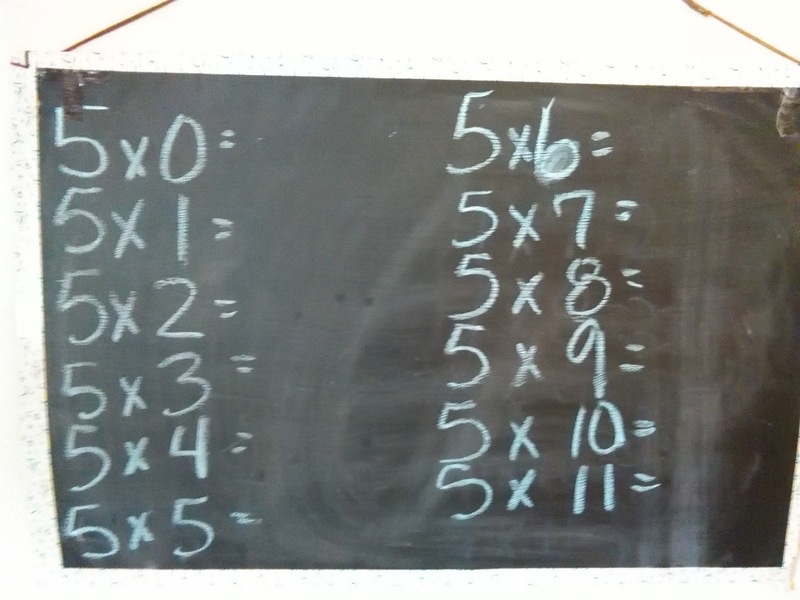 As a former teacher [and any teacher], I know how quickly items can add up. Plus when you are assembling your own curriculum it can be another added cost. 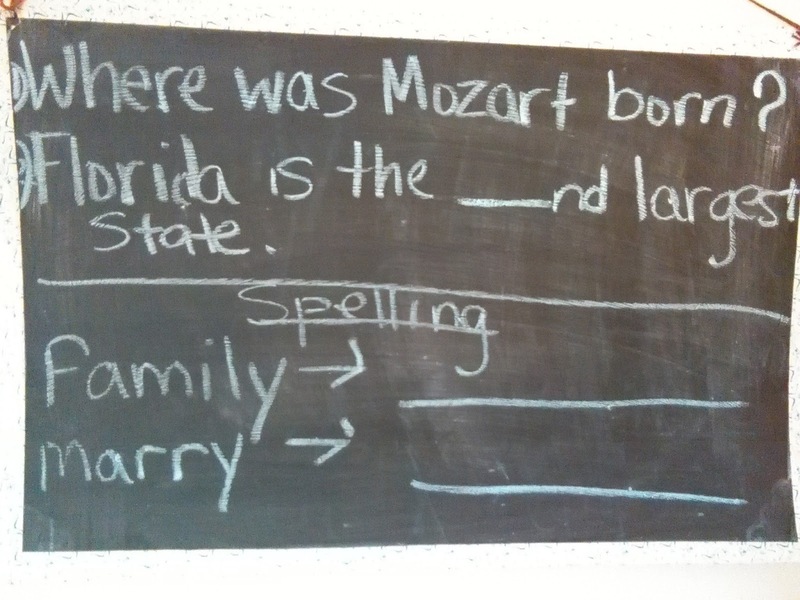 For a blackboard I have a very limited budget. 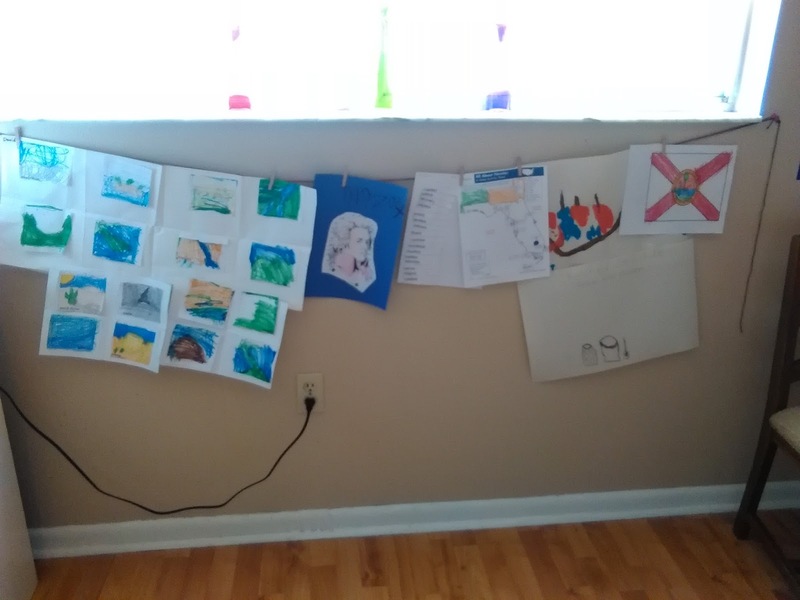 So I used some chalk paint that I had and painted both sides of a foam board, trimmed it in decorative tape, used yarn to affix it to the wall. It makes it easy to switch sides and is just big enough to do small amounts of work. One last thing that I was so pleased with was David's handwriting. He has always struggled with it, but over the last 6 months or so, he really regressed with it. Because of difficulty in focusing, you have to be with him one on one much of the time. Encouraging him to slow down, to form his thoughts, to follow the lines. I was so happy to be able to do that with him. 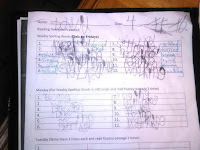 You'll see a before shot of his writing [after his regression] and then an after for his first week being homeschooled. So there we are! One week down! He's looking forward to next week because we are diving into the skeletal system for science! I can't believe there are only 5 more weeks of school. Though we'll be continuing some work through the summer, I'm looking forward to a fresh year in the fall!